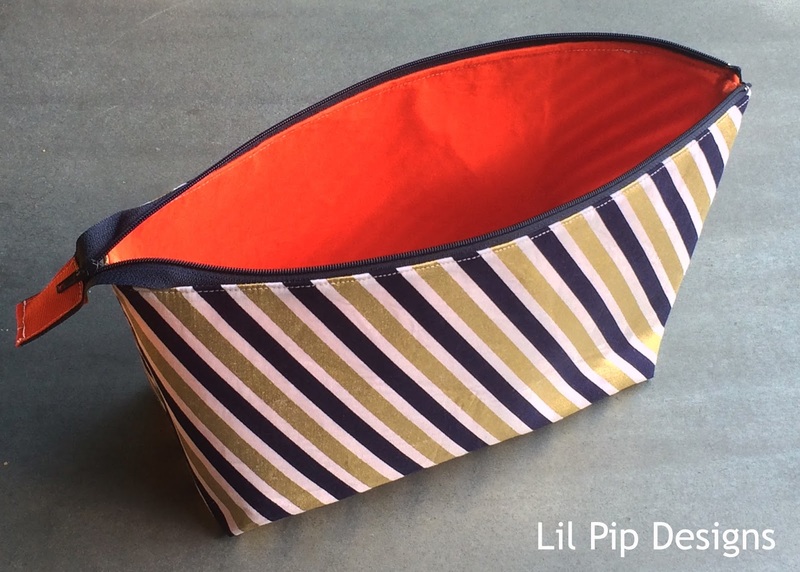 Lil Pip Designs: Open Wide Zipper Pouch - glam style! Open Wide Zipper Pouch - glam style! When my swap partner - Leanne from Sewn by Leanne - told me her fabric colour was orange, I might have panicked. I really don't have ANYTHING in my stash that is orange. Other than this single solid piece of cotton (which is quite thin, possibly a poplin?). I wanted to make something with her favourite colour so decided to use it for lining a zipper pouch. I used the Open Wide Zipper Pouch by Noodlehead tutorial - I use this technique so much now! And decided to go glam with this navy and gold fabric I picked up from Spotlight. This one is much bigger than the other little hexie pouch I made. Perfect for storing sewing supplies or even could be used as a clutch for a day out. Nice! I love all the metallic fabrics around at the moment. Open wide zipper pouch is one of my fave patterns. Denim owl bag for me!